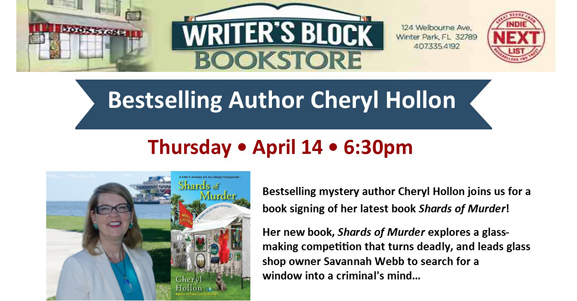 Bestselling author Cheryl Hollon will be signing her latest novel, Shards of Murder (Kensington, February 2016) at Writer’s Block Bookstore, 124 E Welbourne Ave in Winter Park, Florida on Thursday, April 14th at 6.30 pm. Cheryl Hollon writes full time after she left an engineering career of designing and building military flight simulators in amazing countries such as England, Wales, Australia, Singapore, Taiwan and India. Fulfilling the dream of a lifetime, she combines her love of writing with a passion for creating glass art. In the small glass studio behind her house, Cheryl and her husband design, create, and produce fused glass, stained glass and painted glass artworks. She is a member of Sisters in Crime, the Florida Chapter of Mystery Writers of America and the Tampa Chapter of the Romance Writers of America. 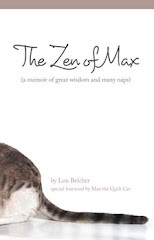 A mystery conference addict, she regularly attends SleuthFest in Florida, Malice Domestic in Washington, D.C., and New England Crime Bake in Dedham, MA. Cheryl and her husband live in St. Petersburg, FL in a 1920’s Craftsman Bungalow. Learn more at www.cherylhollon.com.